Every year I plant more and more rhubarb. It is such a versatile fruit (well technically a vegetable but is eaten as a fruit) and looks beautiful in the garden. The other reason I love it is because of the 50 plus plants I have in at the moment, all but a couple stay producing all year round. After spending the spring and summer making rhubarb cake, and strawberry rhubarb jam, I stumbled across rhubarb and ginger chutney (which is great with corned beef!). 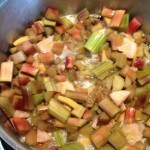 Last week I ventured into rhubarb and ginger jam. Finally I delved back into making an old favourite – sparkling rhubarb, very easy to make, just takes 2 weeks for the bubbles to form, but is drinkable within 48 hours. It is a beautiful pink drink that my kids like to drink also in a wine glass, but is great for adults too! Combine the rhubarb sugar, lemon, vinegar and water in a food-safe bucket, cover loosely with a clean tea towel and leave for 48 hours. Strain and pour into very clean bottles and seal. 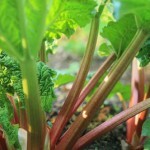 The sparkling rhubarb will be ready in 2 weeks. Chill well before serving and open very carefully!! This recipe makes about 4.5 litres, which wont last long once you’ve tried it! looks like a naughty breakfast! The remaining fruit ‘pulp’ can be put straight into a saucepan with a little of the sparkling rhubarb and stewed and tastes amazing. Who would have thought lemon & rhubarb would marry so well. Yesterday I put the stewed pulp into a pie for friends and there were no complaints –and I finished the last piece this morning for breakfast!! WARNING – Do watch what bottles you put the sparkling rhubarb in. Generally my mum who makes this drink all the time, uses plastic softdrink bottles. Then its easy to know when its ready to drink because the bottle builds up pressure and you can feel the bottle to see if its pressurised enough. IF you use wine bottles, which you can, don’t store them for too long. During a romantic evening meal a few years ago, a bottle of sparkling rhubarb in a wine bottle I had forgotten about for at least 6 months, exploded out of the wine rack and hit me in the back of the head from meters away! This year I am trialing some vintage ‘swing-stopper’ vacola bottles and I think I’ll release the lid a little before I store them in a firmly lidded tub in the laundry! Another note this recipe is quite versatile. We made rhubarb & strawberry one year and was equally as delicious (more delicious! –wade). Let us know if you Give this a try!! This entry was posted in education, Home-life Skills, In the Kitchen, Uncategorized and tagged bubbles!, Rhubarb by humble house. Bookmark the permalink. Just letting you know that I am watching you. 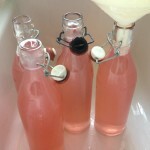 Hi I made my first rhubarb wine last fall and was wondering if I could add some flavourings now to change up some of the bottles. I will be bottling it this week and should get 28 bottles. Just wanting to change it up a bit. Any suggestions? Sure you can, .. caveat. spices impact the fermentation, be careful how much you use. We’ve upped the lemon in ours, mostly for the flavour in the peel after the bottling, which we dehydrate for a crazy sweet-sour snack. 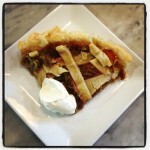 It’ll do great with some apple, but to be sure the rhubarb seems to dominate the flavour whatever we add. If you come up with something interesting we’re all ears too!